AGCO is now offering the new 9500VER and 9700VER (Vacuum Electric Ready) Precision Planting-ready toolbars within its White Planters line. – 16-row, 30-inch row spacing. Both the 9500VER and 9700VER toolbars consist of maintenance-free, all cast iron 9000 Series row units. The new 9500VER toolbar is equipped with a durable three-section, flex-and-forward-fold, 7-inch x 7-inch frame; a two-tank, 90-bushel, central-fill seed-delivery system (CFS); hydraulic lift and fold systems and folding marker selection. Two 45-bushel polyethylene hoppers are standard for the CFS on all 9500VER toolbars. The lids are easy to reach from the platform, and the oversized hopper openings make filling more convenient. Gauge wheels with equalizing walking beams, eight 12-ply tires and safety equipment round out the 9500VER’s features. The 9700VER toolbar has durable three-section, flexible, 7-inch x 7-inch hydraulic stack-folding wings and a hydraulic fold system. The frame provides consistent toolbar height, maintaining row unit depth control across the width of the planter in varying terrain. Gauge wheels with four 9.5L x 15, 8-ply tires and safety equipment round out the features on this toolbar. 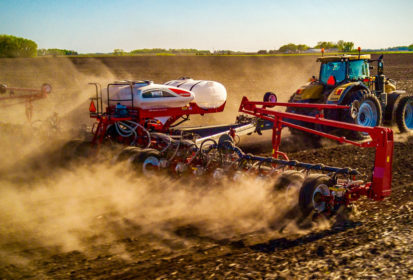 Both toolbars can be customized with add-on options such as the Bullseye, WaveVision and SpeedTube seed tubes, the proven and reliable vSet meter, vDrive electronic drive system, vDrive Insecticide meters and DeltaForce hydraulic downforce from Precision Planting. For more information, visit your nearest White Planters dealer.